This is the second period piece surrounding a Queen of England this holiday season. Mary Queen of Scots was the first one I saw, which featured Queen Elizabeth while The Favourite features Queen Anne. Of course, the two films could not be more different. Mary, Queen of Scots is a drama surrounding the power of a woman and the men looking to bring her down where as The Favourite is a dark comedy featuring the nasty things a couple of women would do to gain favor with the Queen. Queen Anne (Olivia Colman) is ruling over a country at war with France, but she has to deal with the daily problems of a monarch. Her friend and confidant Lady Sarah Churchill (Rachel Weisz) helps with the oft-ill Queen and aids in decision making in her stead. When new servant Abigail (Emma Stone) arrives at the castle, she begins playing different sides against one another to raise the level of her happenstance. The interactions and manipulations between the three lead ladies in this movie is the main strength of the film. Olivia Colman is just brilliant as the lonely and forlorn monarch. She brings so much emotion and gravitas to the role that you can see why her name has been bandied about in Oscar discussions. Queen Anne has to deal with physical pain from the gout, emotional pain from the loss of children, and the loneliness of the throne which finds her snapping into uncontrollable rages over the littlest things when she feels slighted (in particular from a low self-image about her appearance) or feels as if there are parts of life in which she is missing out upon. Rachel Wiesz’s Lady Sarah has taken to the power of having the ear (among other body parts) of the Queen and she is not afraid to play that power with the household staff or the heads of state. When Abigail arrives, Lady Sarah takes a liking to her and, before she realized what had happened, Abigail had usurped her place at the Queen’s side and in her bed. You can tell immediately that Emma Stone was more of a force than she was being given credit for and that Lady Sarah would regret the oversight. 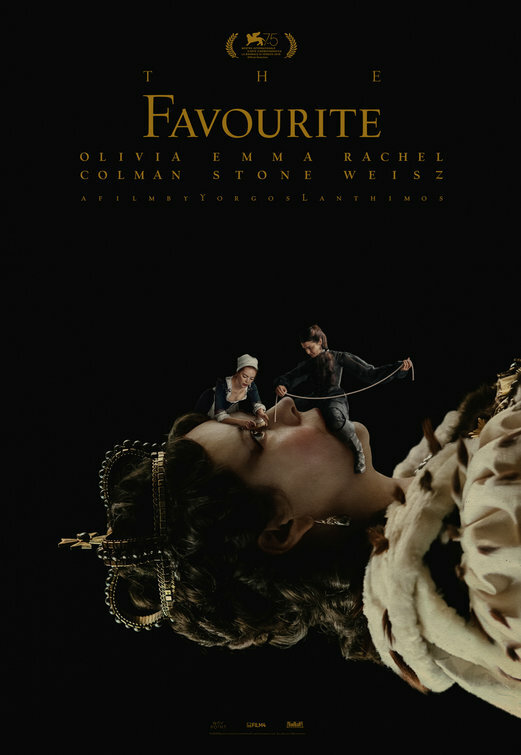 Directed by Yorgos Lanthimos (The Lobster, The Killing of a Sacred Deer), The Favourite dives deeply into the world of these three women and their desires and wishes. Two women who want to gain power by the hand of the Queen and a Queen who encourages the jealousy while slowly succumbing to pain and anguish. The movie lacks a strong conclusion, but the darkness of the comedic takes makes up for the missing aspects and three dominant performances make this a must see.